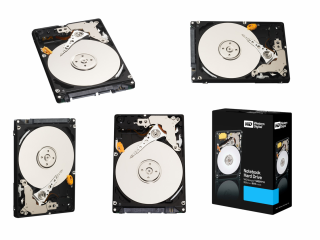 Western Digital has started shipping its new 250GB WD ScorpioT 2.5-inch Serial ATA (SATA) hard drives. It's the highest capacity mobile hard drive for notebooks and uses perpendicular magnetic recording (PMR) technology. This achieves the highest capacity available in a small drive and also contains new features to make the drive quiet, use less power and run at cool operating temperatures. "The 2.5-inch market continues to be a major focus for WD, and this 250GB WD Scorpio drive represents our second-generation PMR platform," said Jim Morris at Western Digital. "The WD Scorpio 250GB hard drive is a direct result of the significant investments WD has made in proprietary head technologies as well as significant system level feature innovation." Demand for 2.5-inch hard drives continues to increase at a rapid pace, driven by notebook computers, portable storage devices and consumer electronics products. Users of these applications need high capacity drives to manage storage-hungry content. The new WD Scorpio drive further expands the company's breadth of 2.5-inch mobile hard drive offerings to capacity points ranging from 40GB up to 250GB. WD Scorpio 250GB drives are available on the company's online store . Estimated pricing inclusive of VAT is £115.00.